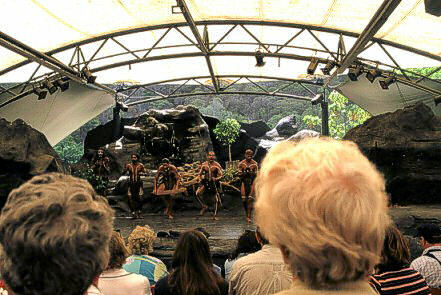 It was the first Aboriginal culture centre we visited and the only one in Queensland. And on their entrance they proudly show off a couple of tourism awards they won. But after seeing a whole lot of these awards on so many places, it gave me the feeling they can't be hard to get. Anyway it was interesting to have an exercise on boomerang throwing, explanations what food can be found in the bush and a short movie introduction on Aboriginal culture. But these young, intelligent looking lads doing education and show alike gave me the a lively idea of what they might do after work. They would sit with their friends laughing, rolling on the floor and biting the carpet. Must be so funny to them what simple kids play can be done to make tourists pay for.